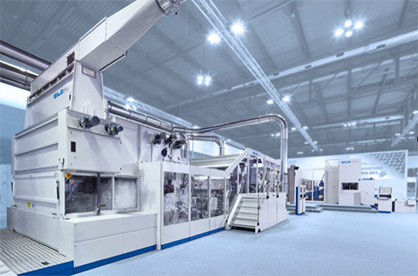 The most recent machine concepts from DiloGroup companies DiloTemafa, DiloSpinnbau and DiloMachines will be promoted with the emphasis on new equipment components which improve product quality, increase line capacity and furthermore enable new opportunities in nonwoven production. 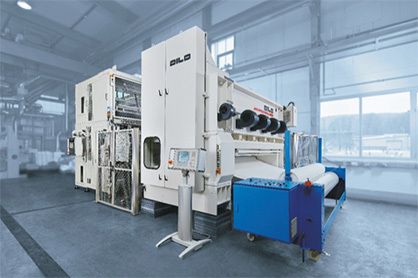 Dilo is the leading equipment supplier of complete lines for staple fibre nonwoven fabric production. DiloTemafa has introduced versions of the Baltromix bale opener and the card willow which are particularly suited to the processing of longer fibres at highest throughput. Longer cleaning intervals and shorter cleaning times also result from the design changes. The DON dosing opener remains as an intermediate between fibre preparation and the card feeder and provides a fine opening stage. The “VectorQuadroCard” incorporates a modular transfer group between breast and main section. The quick change facility of this roller group provides different carding options. The delivery system is also flexible to provide parallel laid, random or condensed web. The preopener section on this card has 4 worker/stripper pairs with five pairs on the main cylinder. 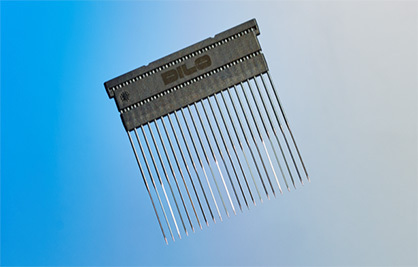 Emphasis is on high throughput with good web quality. DiloMachines has a new horizontal crosslapper version “DLSC” which allows web infeed speeds up to 200 m/min depending on fibre specification. Such infeed speeds will prevent the lapper being the line bottleneck. The DLSC works in conjunction with the proven CV1A web regulation system for improved felt evenness and the potential for fibre savings. A further increase of the drive power within the three-apron-layering technology as well as the application of carbon fibre reinforced parts enables these major improvements. A web guiding system (“extended web guide”) can be added to avoid web wrinkles at lapper reversals. Developments underway relating to the needling process include “Needle Module Technology” whereby needles are pre-mounted in multiple units of 22 for insertion into very high-density boards. It is reducing visible marking patterns on the product´s surface significantly. Furthermore, it enables a simplified Needle insertion and shorter setup time. The Dilo Compact Line includes fibre opening and blending, card feeding, carding and crosslapping, needling and winding. 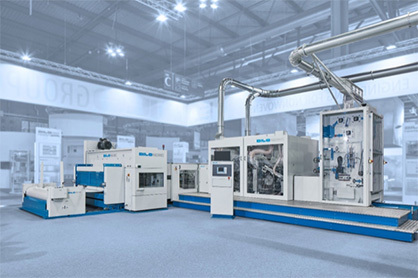 The working width of the compact carding machine is 1.1 m, the layering width is 2.2 m. The line which was first presented at the ITMA 2015 in Milan, Italy, is characterized by consistent focusing on a compact line layout, a fast adaption to changing production conditions and an economic mode of operation. For this purpose numerous innovations were realized in every single machine. These innovations also facilitate the modifications necessary for the needling of carbon fibre. Dilo has introduced a new “HyperTex” technology which produces multi-layer felts made from base web, reinforcing layer and upper web. By using the scrim fabric machine of Ontec Automation GmbH it is possible to integrate a grid of unconsolidated yarn or filaments between two webs. The scrim can be fed inline and is then needled together in the subsequent needle loom. A great advantage of this method is the very high production speed for the complete process. Scrim formation and subsequent needling achieve speeds up to 40 m/min.